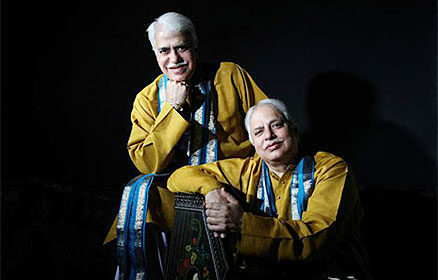 The inimitable duo Padmabhushan Pandit Rajan & Pandit Sajan Misra are two of today’s leading Indian classical vocalists of the North Indian khyal style. Born into a 300 year-old family lineage of distinguished musicians, the brothers belong to the Banaras Gharana, and began their musical studies at a very young age. Their mellifluous voices combine with masterly command over ancient and highly complex techniques and bring a distinct rare sensitivity to their art form. Pandit Rajan & Pandit Sajan Misra have delighted audiences all over the world, and their creativity and contribution to the arts has won them worldwide recognition.